It’s a shame I haven’t visited Gusto 101 until now. It’s a turn off when a restaurant doesn’t take reservations and you’re greeted with a long line at the door. Friends who visited complained about slow snobby service and so I never went. Then all the sudden, I dined there twice in the same month – for brunch and dinner. We were able to secure a reservation for brunch, there wasn’t a long wait for dinner, and in both instances service was friendly and efficient. A good start already. Although a little difficult to cut without scissors, their spinaci pizza ($17.99), nonetheless, incorporated a wonderfully thin crispy crust. 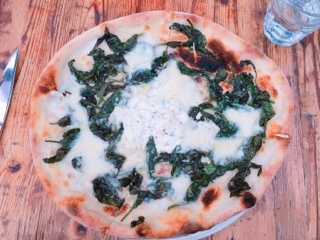 There was certainly plenty of cheese, ricotta and buffalo mozzarella, so there’s a creaminess to the pie. Meanwhile, the toasted spinach reminded me of kale chips and there’s just enough garlic for taste. Without a doubt their mafalde ai funghi ($18.50) is a top-seller. As each one was whisked by, the frilly plate of pasta peaked my interest and instantly pizza felt like a poor choice. 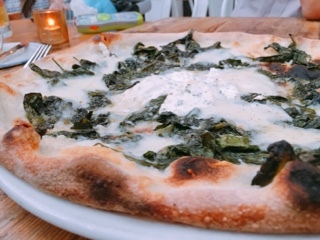 Luckily, my friend magically ordered the star dish and what a heavenly smell it admitted with the truffle cream sauce. 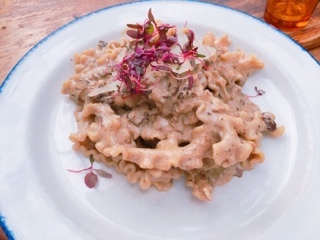 Small pieces of portobello, porcini, and oyster mushrooms are studded throughout, but the al dante drenched creamy pasta is certainly the highlight. Both of the above dinner dishes are also available during brunch. However, there’s an extra page of delightful eats making the weekend lunch hour the best time for a visit. 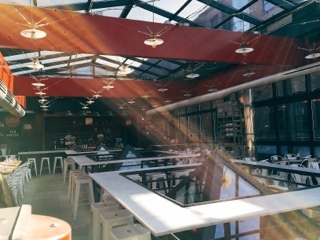 If you’re seated on their sky light second floor and the weather’s nice, don’t be surprised when the roof slowly retracts and soon you’re eating on a patio (although the open air, food, and fauna walls sure does attract wasps). The uova in camicia ($12.50) is a lovely breakfast that hits the spot without being overly heavy. 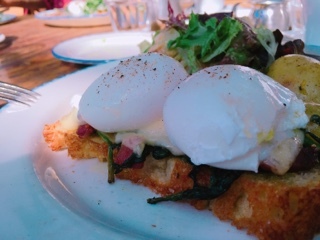 Gusto’s take on eggs benedict, there’s the customary poached eggs – the twist is they sit atop a buttery toasted brioche stick. With spinach, crispy prosciutto, and sliced fontina cheese the dish could be overly rich, but the restaurant balances it out with plain roasted baby potatoes and salad. Trust me, you’ll want to split an order of the avocado toast ($8.99) as a starter. 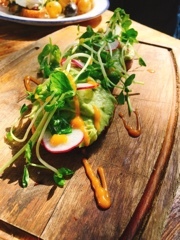 Of course, it’s something to tide you over until the main arrives, but the lemony guacamole topped with radish and pea shoots is also insanely delicious. Such a simple but tasty dish with a zip of spiciness. Gusto 101 is a nice reminder that sometimes you can’t trust the opinion of others – I should have tried it earlier! Nicely prepared staple dishes with fresh ingredients … like the restaurant’s name spells out, that’s just Taste 101.